Noah and Lloyd Graff recently interviewed Esben Østergaard, founder and Chief Technology Officer of Universal Robots. Universal Robots produces what it calls "cobots," low cost but powerful robotic arms meant to aid workers on the factory floor, rather than replace them. Most people can learn to program the robots in a free 88-minute online course. Today’s Machining World, Graff-Pinkert’s sister company, just launched its weekly podcast, Swarfcast! The podcast centers around similar topics that readers have enjoyed in Today’s Machining World during its first 18 years. Noah Graff recently interviewed Miles Free, the Precision Machined Products Association’s Director of Industry Research and Technology. He’s a guru of machining industry world politics and one of the world’s foremost experts on the steel trade. In March when President Trump tweeted his intentions to implement a 25% tariff on steel and a 10% tariff on aluminum coming into the United States, Free was bombarded from news outlets around the globe for his analysis—he really knows his steel. He compared the tariffs to the economic sanctions on imports that the United States would inflict on an enemy like Russia or Iran. “Nobody would have dreamed that the White House would ever use an entire industry as a negotiating technique” Free said. 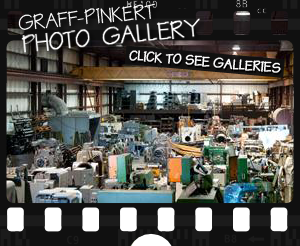 Graff-Pinkert is more than just a machine tool dealer. We are a company that provides solutions for our customers' manufacturing challenges. We sell machines ready for customers to start making parts on their floor. Watch this video to learn more about what Graff-Pinkert can do for your machining firm. Graff-Pinkert is very excited to be offering a valuble new service, matching buyers and sellers of machining companies. With its extensive contacts around the world and rich knowledge of the machining industry gleaned from 75 years in the business Graff-Pinkert is in a unique position to help machining companies looking to grow as well as help owners who want to retire or capitalize on their assets. If you are interested in buying or selling a machining company contact Graff-Pinkert for a consultation today. I normally deal in subtleties — close calls on whether to buy a machine, take a gamble, hire a new person, eat a piece of pie. But occasionally a deal comes along that is so breathtakingly clear you just shake your head and say YES! We are in one of those odd moments. When the handwriting on the wall is so clear even a blind man can read it. The investment incentive, Section 179 of the Federal Tax Code, can bring savings of more than a million dollars in taxes in the right situation, and is most likely ending in three weeks. The photo above is a Graff-Pinkert ad in the Serial Number Reference Book For Metalworking Machinery 7th Edition from 1979. Graff-Pinkert & Co. has undergone a lot of changes since my grandfather Leonard Graff and his cousin Aaron Pinkert started the used machine tools business back in 1941. We've been in business almost three quarters of a century, and it's mind boggling how many multispindle screw machines we've sold and then ended up buying back decades later, which we then refurbish and sell to new customers.